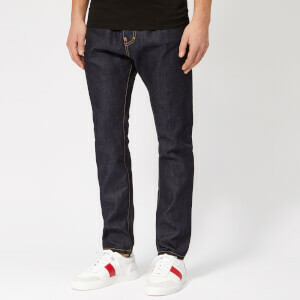 Men’s slim blue jeans from Versace Collection. 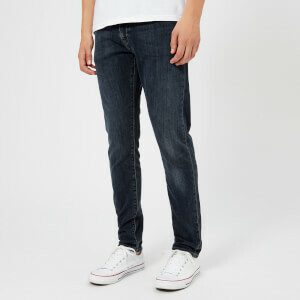 Crafted from slightly stretchy denim, the five pocket jeans are detailed with silver-tone, logo engraved rivets, ‘V’ stitching on the rear pockets and signature half medusa head logo embroidery on the rear right pocket. 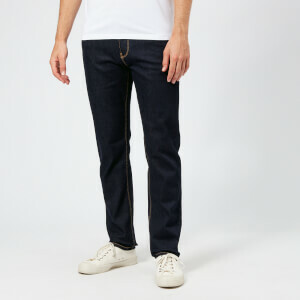 Fastened with a top button closure and zip fly, the jeans are finished with tobacco coloured topstitching, belt loops and a leather logo patch to the rear waistband.